Billy asks Anne if she is OK as she leaves No. 32 and Anne makes excuses about needing to wash her hair. Billy can tell she doesn't want Caitlin staying around. Anne tells Billy that Caitlin is after him and it is going to be awkward. Billy assures Anne that he loves her and nothing is going to change. They hug as Toadie approaches, ecstatic about Caitlin staying! TOADIE: Is this street chockers with babes or what? I mean, I thought it was gonna be a little dull when Claire leaves to go back to France, but now that Caitlin is staying – wahoa! Babe- o- rama! Toadie says Billy would be drooling too if he weren't with Anne, and tells Anne to keep on eye on Billy so he doesn't have any competition! Mandi is excited that Caitlin can join the swimming squad now but Caitlin is clearly not happy so Mandi leaves to catch the train home. Caitlin wants Ben to explain why she has got to stay with him. Ben suggests she call their parents but Caitlin says she obviously doesn't matter to them. Madge serves Claire and Hannah with massive ice cream sundaes. She lost count of the scoops because the place has been so busy! Hannah says it must be because Debbie is back as manager! Hannah has got to do an assignment on the history of the local area but she doesn't want to ask Helen because she's too sick. 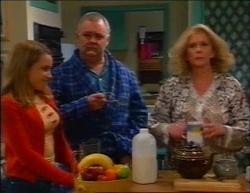 Madge tells Hannah that her grandfather was pretty much responsible for the Erinsborough they know and love today. He was mayor of Erinsborough once, and Ramsay Street is named after him. PHIL: Black Jack Ramsay is a liar and a cheat! Erinsborough should be ashamed to have a street named after him! 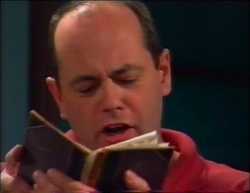 Phil is reading from Great- Grandfather Robinson's diary. Hannah is confused and Phil says Madge is biased about her family. He shows Hannah photos of Jack Ramsay and Great Grandfather Robinson. Hannah reads from the diary about the council looking to subdivide and the Ramsay family disputing the Robinsons' borders again! 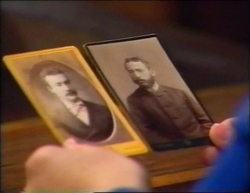 Phil explains that there was a card game, the stakes of which were the land that Ramsay Street is built on. Hannah is won over and pronounces that the street should be called Robinson Street because Black Jack Ramsay cheated! Phil tells Hannah that there has been enough feuding between the Ramsays and Robinsons; it's better to leave it in the past. Ben finishes playing the guitar and tells Caitlin he misses home and it's good to have her here. Caitlin requests mashed potato like mum used to make for dinner. She goes to have a bath. Sarah arrives home, exhausted, and wants a bath and is annoyed that Caitlin has beaten her to it. Ben breaks the news to Sarah that Caitlin is moving in. A hand is seen removing the Ramsay Street sign from its post in the dark. Madge is finishing off a trifle as a special treat for Harold because of all the job hunting he has been doing… and because if she had left it in the shop it would have gone off! HAROLD: No alcohol, I trust? MADGE: Oh come on, a little drop of brandy's not going to do you any harm! MAGE: Alright, alright, it's alcohol free! 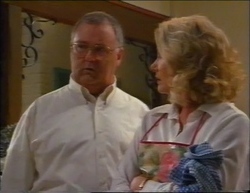 Harold opens the door to Marlene who has come to let them know that Lou will be acting as landlord while she is away. 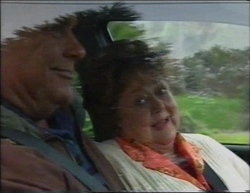 Harold comments that her going away with George is very sudden and asks if she has any reservations about it. MARLENE: Harold, are you questioning my moral standards? Harold says you never know what other people might think and Marlene worries that people have been talking. Madge assures Marlene that everyone is very happy for her but Marlene doesn't look convinced. Ben and Sarah are arguing about Caitlin. Sarah likes Caitlin but doesn't want to share her home with a teenager or be responsible for her. Caitlin overhears and says she's used to people not wanting her. Billy and Toadie are trying to make dinner and Billy wants Toadie to stop going on about Caitlin because Anne is paranoid. 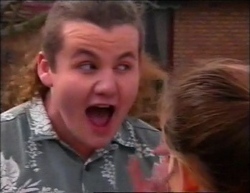 Toadie is jealous when Billy admits that Caitlin told him she likes him. TOADIE: If we could clone a human being with, like, your pulling power and my brains… fight ‘em off with a stick! Caitlin arrives, upset about Sarah not wanting her around. 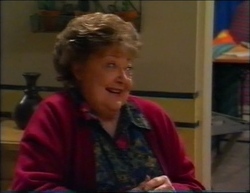 Toadie tells her to stay here and Billy signals him to drop it! Billy says they have no room and Toadie says she can stay in his bedroom! 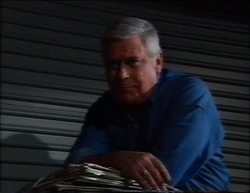 Lou is bundling up recycling and Marlene is worrying about what Harold said, which Lou thinks is hilarious. He tells Marlene to think what a boring place the world would be if everyone always listened to Harold. Ben comes home, having failed to find Caitlin. Sarah is apologetic. Caitlin comes in the door and Sarah tries to convince her that she is welcome. Claire is bored of Hannah poring over the diary and snatches it from her, telling her she won't get the truth from an author who was too much a part of it. Hannah concedes, and wonders if the library would have anything. Claire says there's no way they are going to the library! Hannah says she has to write about it for her assignment but Claire says they don't know who is right and who is wrong so she can write about the mystery of it. She comments that someone has stolen the street sign again and says tomorrow they will make their own mystery… and start a new big fight! Claire climbs down from the stepladder early the next morning. Hannah worries about getting into trouble from Madge. 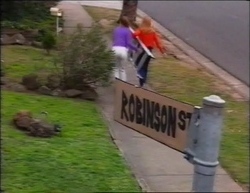 The camera pans up to reveal they have replaced the Ramsay Street sign with a cardboard Robinson Street sign! Madge sneaks up on Harold as he is eating his breakfast and looking at job adverts in the newspaper. Madge says he will probably hear back about some jobs today but Harold is not so sure. Claire comes back in the house and says she was helping Hannah with her schoolwork… about how Black Jack Ramsay cheated the Robinsons! Madge is enraged and says she went through all this with Scott. MADGE: Just wait till I speak my mind. I'll wipe the smug little smiles off their faces! Lou gets in the car with Marlene who is considering backing out of the cruise after what Harold said. Lou offers to have a word with George but Marlene says she will do it herself. Sarah has written some house rules and asks for Caitlin's input. Caitlin is happy that she gets a say. Sarah tells her that if she acts like an adult she will be treated like one. Caitlin says she could get used to living here after all! 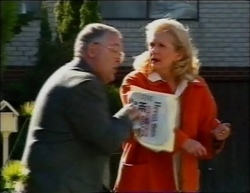 Harold drags Madge away from the Martins' house, trying to dissuade her from confronting Philip. They turn around and see the Robinson Street sign and Madge promptly marches back towards the house. Caitlin leaves number 30 as Anne is walking Bonnie. Anne asks for a word about what she said about going after Billy. She tells Caitlin that Billy is her boyfriend and she doesn't want her stealing him from her! Caitlin baits Anne, saying she might not have to steal Billy if he leaves Anne of his own accord!